Gold galore. The 18K solid gold head and tail are intricately carved and textured. The black lip pearl is carved as feathered wings. Very detailed and overlapping visually. 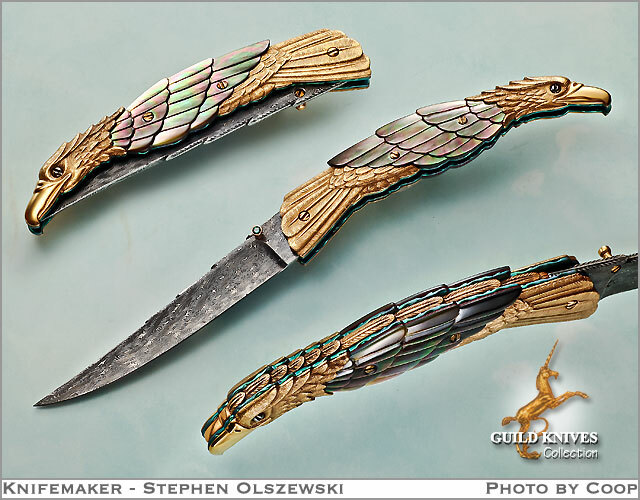 Jerry Rados Turkish Twist Damascus was used for the blade which supports a gold cabochon with a faceted inset emerald. The backspine and blade are carved as feathers with a thick 18K caved gold bar set into the backspine that runs the full length of the handle back. This is a heavy knife due to the huge amount of gold, as gold was about $350 an ounce when Stephen made this knife for me, several years back. Work like this is seldom offered for sale. Carved 18K Gold and black lip pearl.